Do you like 'em curvy? LG has officially confirmed the intriguing G Flex smartphone will go on sale in 20 European countries, starting next month. The handset, which was announced in October for the Korean market, will go on sale in the UK, Germany, France, Italy, Sweden, Austria and others. 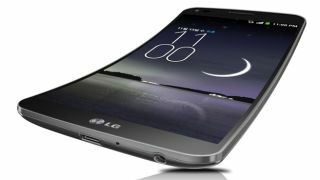 Although the 6-inch 720p curved device has been available to pre-order from the likes of Carphone Warehouse during January, this is the first time LG has officially acknowledged plans to launch in Europe. So far it has only been available in the company's Korean homeland, while a U.S. launch was recently confirmed at the CES tech show at the beginning of the month in Las Vegas. For what's likely to be a considerable expenditure (CPW wants £689 up front), those wishing to try a curved handset on for size, will also benefit from a 2.26GHz Qualcomm Snapdragon 800 chipset, 2GB of RAM and an embedded 3500mAh battery. Only sitting within the G Flex is a 13-megapixel camera and a 2-megapixel front-facing webcam. The device will arrive out of the box with Android 4.2.2 Jelly Bean. It also boasts of a Wolverine-like self-healing coating that makes it impervious to scratches and nicks, according to the company.